Broadbills are small to medium-sized birds ranging from 4.5 to 10.8 in (11.5-27.5 cm) in length and weighing 0.35-6.0 oz (10-171 g). Broadbills share a host of characters in their syrinx and hindlimb musculature. Except for Calyptomena they are unique among the passerines in having 11 primaries. Most species have an exceptionally wide bill and gape. The dusky broadbill (Corydon sumatranus) beats all records among the passerines with a pink, hooked bill that is as wide as it is long. It even surpasses the skull in width. The more frugivorous Calyptomena and Pseudocalyptomena have a much narrower bill, but have retained a wide gape. In terms of plumage coloration, the broadbills are a diverse group. 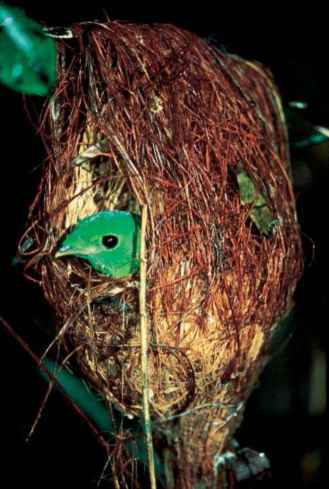 Apart from a few dull-colored species, most broadbills are quite colorful, spanning the range from blue to red. 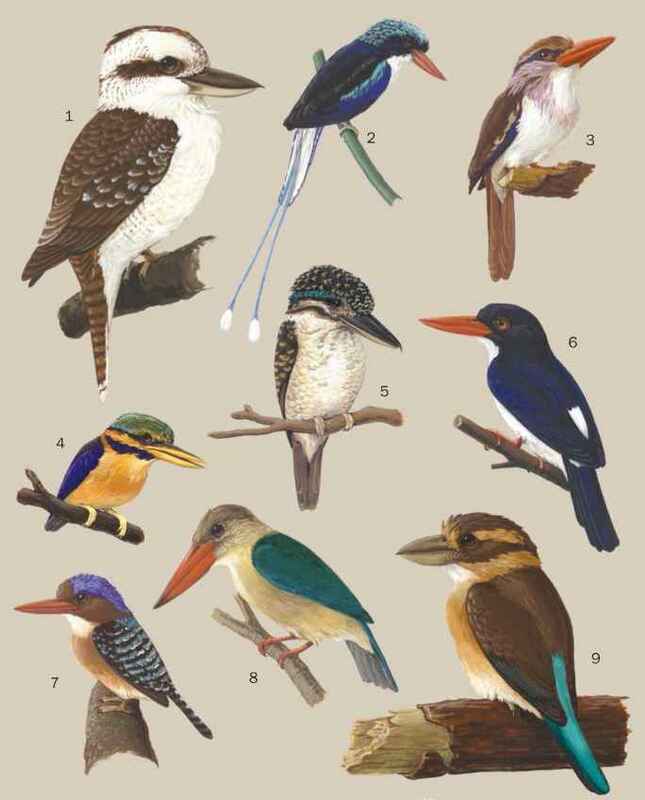 Some species also have an area of bare skin around the eyes that is blue in the two Philippine Eurylaimus and pink in the dusky broadbill. Whereas the two sexes look alike in some species, more or less subtle difference can be found in others. Sexual dimorphism is most obvious in Calyptomena. Here the males are more intensely colored and the loral feathers form a forward facing tuft that covers the base of the bill, resembling a small crest.